Some of our staff eat grilled salmon for dinner every other night for its healthy omega-3 essential fatty acids. There are many ways to keep grilled salmon interesting. But instead of topping it with sugar-laden chutney, sauces and glazes, take a healthy approach. 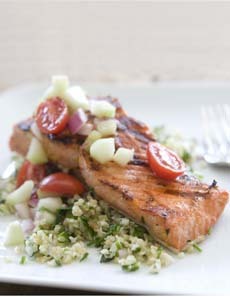 In this idea from Whole Foods Market, grilled wild salmon (so much better than farmed salmon) tops a mound of tabbouleh, which is made with whole-grain bulgur wheat. The salmon is marinated in olive oil, fresh orange juice and zest. It’s topped with a Middle Eastern/Israeli salad of chopped cucumber, red onion and halved cherry tomatoes. We add dill and/or parsley to our chopped salad. In season, substitute chopped vine-ripened tomatoes. We purchased our tabbouleh to save time, but here’s the recipe to make it from scratch, along with the citrus-marinated salmon. those omega-3s with whole-grain tabbouleh. Photo courtesy Whole Foods Market.